“It happened in one night: a girl who died now walks among the living; Zil and the Human Crew set fire to Perdido Beach, and amid the flames and smoke, Sam sees the figure of the boy he fears the most: Drake. But Drake is dead — or so they thought. Lies is the third book of Michael Grant’s Gone series, but I could’ve been fooled. What happened to the greatness I saw in Gone? Or the promise that was in Hunger? Lies falters in every way, and it doesn’t even feel like part of the Gone series. After the events of Hunger, where the gaiaphage (also known as the Darkness) was defeated and Drake was finally killed, I was really hoping that author Michael Grant would now move on to more important things: like the discrimination issue, the ideal civilization that some characters wanted to build, the problems of leading a kid civilization, how they got stuck into the FAYZ (which stands for Fall-out Alley Youth Zone). Instead, we get a retread of Hunger, with a less likeable cast of returning characters, and a host of new ones who will probably die in the next book anyway. And then there’s Alberto. After being set up as this ambitious power player in the second book, you’d think he’d play more into the events of Lies–but no. Save for one key moment with him and Quinn, you don’t even notice he’s there at all! Come to think of it, save from Astrid, none of the major players in the first two books seemed to have done anything at all. This book feels like filler. Instead of moving the plot forward, we get another battle with the gaiaphage–whose first appearance already tips you off of its identity before it could be revealed as a twist in the end. Again, Little Pete and the gaiaphage battle it out with their powers, which runs under the main plot of Sam having a dilemma with his position as leader (again), of the humans versus mutants issue (still), and Caine’s bid for survival. Actually, the only thing of note in this book is Caine’s group moving from Coates Academy to one of the islands. It’s basically set up for when Caine returns as a major villain. Oh, and it also introduces yet another psychotic villain who might replace Diana in the next books. Which I think is highly unnecessary. Putting down Lies, I must say that I am not looking forward to reading the fourth book in the series. While Gone and Hunger didn’t differ much in terms of quality, and that was okay, I felt Lies should’ve started building up on what the first two books have already set up. But it doesn’t. Author Michael Grant keeps introducing new characters into the mix, diluting what made the premise of Gone so interesting in the first place: a core group of kids take action into shaping up a new civilization as the one they’re used to falls apart. Instead we just another fantasy novel about kids with powers battling a force greater than them, and arguing during the rest periods from the war. I hope that, in the fourth book, the author finally stops adding questions to the pile we already have–that he starts delivering answers already. Strike that. I don’t actually mind more questions–so long as we’re also being given answers. Like what happened to the laptop of Sam’s mom? What was she doing about Sam’s and Caine’s powers prior to the big disappearance? We already have a theory by this time on why some kids have started to develop powers–but what is the logic behind the powers they manifest? Why aren’t all the kids developing powers? I have so many questions. Now, I want answers. “All he wants is to break through the prison’s stone walls, to flee the armed guards, to return to his old life. Even if he escapes the prison, he cannot escape what he is. Thirteen feet tall. Hairless. Blue-skinned. His captors see him only as a monster, a rampaging villain with inhuman strength and a temper to match. They call him Brawn. They don’t care about the truth–about the person inside. He is twelve years old and very, very scared. His fear will not last forever. In time, it will be replaced with anger and determination. Some writers tend to stick to formula when writing, but not Michael Carroll. With Stronger, he has managed to tie together the events of five books with a single character–and made it good. In this book, we follow the story of Brawn, the big blue villain we first heard about in Quantum Prophecy (and eventually saw in the third book), before meeting him as a hero in the Super Human series. Through Stronger, we find out who Brawn really is, where he comes from, what had happened to him–and how he was able to become both a hero and a villain, and which side he finally picked in the end. Having read all the books in Carroll’s series, I’ve always championed him as a writer who knew how to write the underdogs. I preferred both Super Human and The Ascension over the original Quantum Prophecy books because they were easier to relate to. Because you had a character who wasn’t super-powered. A character you can feel sorry for. A character you fear might not make it until the end. And it wasn’t so with the Quantum Prophecy books. For some reason, they prophecy itself made the characters and the action boring. You knew that so-and-so would survive. And that made it boring. And yet, in Stronger, you knew exactly where the story was going. You knew the events that were being described. But it is, to me, the most engaging book of the series so far. Has Michael Carroll gotten better as a writer? No. Because he wasn’t bad to begin with. The only difference between this book and the ones from the Quantum Prophecy series is that in Stronger you have a main character you’d want to root for. A main character you feel sorry for. A main character you want to get to know more. With Stronger, author Michael Carroll sews together two timelines and one alternate reality as he tells the surprisingly simple story of a boy who just wanted to come home. And how he realized that he can never go back to who he was. Having read this book, and seeing that the author seems to know where he’s finally going with his story, I’m very excited to find out where he’s taking the story next. “You are indestructible. These are the words that transfer an astonishing power to Jacob Fielding…and they change everything. When Ophelia James, the beautiful and daring new girl in town, suggests they use the power to save others, Jacob readily accepts. But with every heroic act, the power grows stronger and soon feels more like a curse. After all, how do you decide who lives and who dies? Okay, first off, the back cover lied. Jacob doesn’t have “thirteen days to harness this terrifying power,” he has plenty of time. It’s the story that takes place in thirteen days. I wonder who wrote the text for the back cover—and if that person actually read the book. 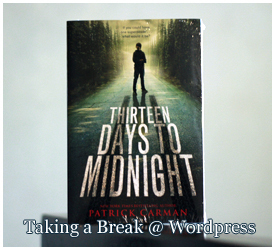 That said, I did enjoy reading Thirteen Days to Midnight. It was a page-turner. But I guess it wasn’t up to par with Warm Blood, which I read before this. For one thing, I’m not raving about this book. Let’s go into the book: In Thirteen Days to Midnight, we have one main character, a love interest, and a supporting character. Jacob, as our main character, immediately has our sympathy. After all, he is our anchor to this world. And while we do get to know Ophelia (the love interest) and Milo (the supporting character), it’s with Jacob that we learn most of what’s going on in the story. Which brings me to my main problem with the story: Jacob keeps a lot of things to himself. And most importantly, he keeps a lot of things from the readers. Reading the book, I thought one of the main themes was loss: loss of a loved one, loss of innocence—loss, in general. And one of his losses, the guilt in losing a father-figure, gets built up so much that I felt it was a cop-out when we finally confront it—and drop it because it doesn’t fit where the story is going towards anymore. Maybe I’m looking at this the wrong way. When I started reading Thirteen Days to Midnight, I thought it read a lot like an episode from a television show—so I read it that way. It had the elements: the aforementioned three characters important to any story, the television set-up of having the dreaded thing happen before flashing back in time to tell the story properly—It was very TV. With this mindset, I guess I was expecting the same payoffs one would have when watching a television show. Especially when it comes to the dramatic moments. Having built-up this guilt Jacob feels over the loss of his father-figure, it was a nice twist for Jacob to reveal the actual events that happened during his father’s death. But it would have been nicer if this revelation propelled the actions our main protagonist took as the story winded down. But instead, it gets dropped in service of another back story that would help tie-up a happy ending for the story. Honestly, I like happy endings. And the ending Thirteen Days to Midnight does give us doesn’t feel like a deus ex machine; the ingredients to the happy ending do get planted throughout the story. But still, I couldn’t help but hold out to the hope that the author would do something different with the ending. Just to be clear though, I still do like how the story ends. One other thing before I completely let this go though: in the book, the love interest also becomes a sort-of villain as the story progresses. While I’m fine with how it happens, and why it happens, I have to say the whole thing didn’t really make sense to me until it was spelled out clearly. That’s because when Ophelia (the love interest) starts becoming the bad guy, we don’t see changes in her character—just in how the author is describing her. The character doesn’t undergo the changes the author is telling us it is undergoing. So when we were supposed to see her as a villain, I was only seeing her as a brat who the main character should just cut loose and let go.